Unfortunately these days some people categorize original brand toner as very expensive and compatible HP toner as likely to damage your printer. Lack of knowledge and information about the compatible toner cartridges can out them at a disadvantage so hopefully we will be able to clarify some of the myths associated with negative press they have attracted in the past. The original toner cartridge is one that is actually manufactured by HP for a HP printer. A compatible HP toner cartridges is manufactured by a third-party and not HP and is therefore a copy of the HP cartridge that doesn’t infringe the copyright of the cartridge. 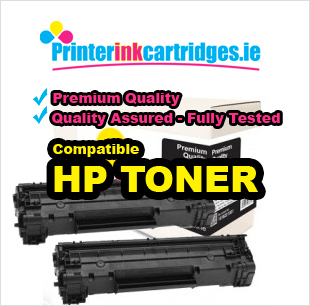 A remanufactured HP toner cartridge is an original HP toner cartridge that has been collected following use, factory cleaned, refilled, repackaged and sold as a replacement for the original. The original brand toner cartridges are manufactured with profit in mind as well as all the overheads that go with the R&D of this and future products. The third-party manufacturers of the compatible and remanufactured toners don’t have the same outlays so they are able to mass-produce toners at a lower cost. However, beware of compatible HP toner that seems to be priced ridiculously low, always check out the social media page of the supplier to confirm quality or issue feedback. First of all it is extremely rare for a toner cartridge to damage a laser printer. If your printer is under warranty and does develop a fault contact your printer supplier. The printer supplier will be required to show evidence that the compatible cartridges were responsible for the problem otherwise repair it under the warranty. If the issue is with the printer it will be covered under guarantee. However, beware of an extended warranty after 12 months as there may be a clause that will allow the manufacturer to void this warranty if you use compatibles. It’s worth checking this out but as I stated earlier, it’s extremely rare for a compatible toner cartridge to damage the printer. Tip: It’s worth noting that if you have original brand HP toner in your printer when it’s checked for the problem by an engineer, then the manufacturer is more likely to come down on your side. In our experience there is no difference in printing every day general-purpose documents or reports using either compatible or original brand toners. In our own trials we printed a selection of photos and text documents using both types of toner and found little or no difference in the print quality. If you are printing photo quality prints then the original toner will give you better results especially if you are trying to achieve consistent colour tones on original photo paper. From the positive feedback we received from our customers we are able to determine that using compatibles HP toner offers huge savings (often up to 100%) at home and in the office, The pros by far outweigh the cons and with good supplier customer support there is no reason not to give the compatible HP toner a try. If you are undecided then contact your online supplier and ask for a guarantee that if you are unhappy with the results they will offer a replacement toner or refund your money.